1. The Naming (Alison Croggon): The Naming is the first of four books that follow sixteen-year-old protagonist Maerad, who begins her training as a Bard in the land of Annar. It's a typical Tolkien-esque fantasy story, but Maerad is an unconventional lead, and the incorporation of music into the plot is unique. 2. Defy the Stars (Claudia Gray): A new release from the author of the new Star Wars books, Defy the Stars, follows a teen soldier named Noemi on the planet Genesis who, due to a twist of events, ends up working together with a sentient machine named Abel. Gray is a particularly skilled sci-fi author, so I'm looking forward to this one! 3. 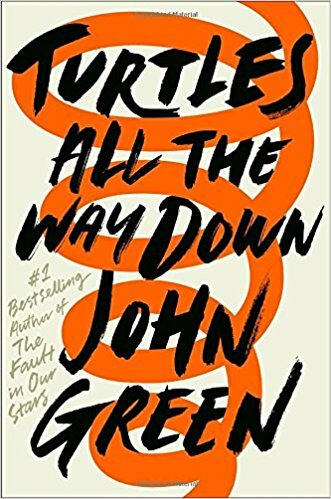 Turtles All the Way Down (John Green): Annie and Ashley think this book is John Green's best since Looking for Alaska! If you've never read John Green, this is a great place to start. The book follows Aza, who has anxiety, and her best friend Daisy. Bonus recommendation: Looking for Alaska has become a YA classic. 4. Nice Try, Jane Sinner (Lianne Oelke): This book is Kate's favorite recent YA read! The plot follows the recently expelled eighteen-year-old Jane Sinner, who enrolls in community college to finish her high school degree. Once there, she decides to apply for a space in a Big Brother-style house featured in a reality show produced by another community college student. Told in a series of journal entries, this book is fast-paced and hilariously snarky, but also surprisingly thoughtful and touching. It turns out that Jane has her own struggles, and she ends up being a character that you can't help but root for, snark and all. 5. Moxie (Jennifer Mathieu): Moxie was Kate's favorite YA book of 2017 and is perfect for the Me Too and Time's Up movements. The protagonist, Vivian, discovers her mother's old Riot Grrrl zines and decides to anonymously make her own girl power zines for her east Texas high school, starting by speaking out against unfair dress codes. Like Nice Try, Jane Sinner, Moxie is hilarious but also full of heart.